Two themes I often talk about are specific functionality from specialist vendors and delivering enterprise solutions in new and friendly ways. A good example of this I came across recently was from small company Chartio. 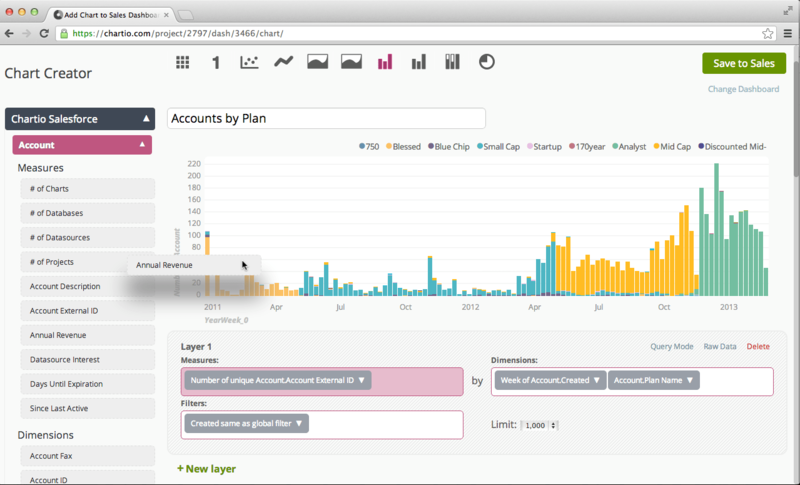 Chartio, a Y Combinator company, touts itself as the best interface for data. Essentially it allows organizations to take data directly from their working database (and not a data warehouse) and display that information in attractive and clear dashboards and visualizations. While cloud companies tend to articulate a “all the data, the way you want it and in real time” story, the reality is sometimes a little different. 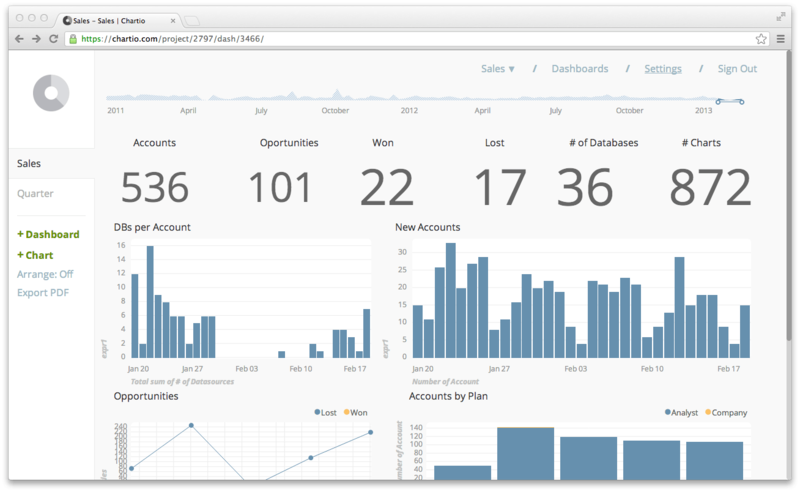 Currently, for example, Salesforce only allows users to see a dashboard or report daily, weekly or monthly. It’s also got a somewhat traditional enterprise approach to depicting information. Of course that will change over time, but a pure play visualization company will always deliver a more customizable and attractive dashboard by virtue of their core focus. I love what Chartio is doing – giving organizations the ability to display the data that is most meaningful to them, and in a way which really ensures its clarity, is a winning formula. That said, it is often the case with dashboarding and visualization products that users focus on the “pretty” and less so on the “relevant and valuable”. One only needs to look at the boon of infographics that appears all over the place to see this in practice – many of these infographics are light on substance but heavy on visual bling. That’s not a criticism of the Chartio proposition, but rather a reflection that no dashboard tool will remove the need for good thought and analysis into what is the right data to expose and how best to do that. That said, this integration will prove very valuable to many organizations, especially so since it gives them the ability to dashboard and chart not only from salesforce but also from their other systems (Google analytics for example). Of course the real value comes when a tool like this supports all the systems of record that an organization uses – and to this end Chartio needs to ramp up the pace of their integration efforts to keep adding more systems. The other factor is that I suspect tools like Chartio will, once they have proven themselves in the marketplace somewhat, become targets for acquisition from companies that wish to add this sort of functionality to their products. Salesforce is an obvious candidate but so to are the integration vendors – either way, the future looks pretty rosy for Chartio. The company was founded in March 1999 by former Oracle executive Marc Benioff, Parker Harris, Dave Moellenhoff and Frank Dominguez as a company “specializing in software as a service (SaaS)”. Harris,Moellenhoff and Dominguez, three software developers previously written to clarify the initial sales automation software. In June 2004,the company went public on the New York Stock Exchange under the stock symbol CRM,raising $ 110 million.Marc Benioff and Magdalena Yesil were early investors based connection and board.Other investors include the beginning of Larry Ellison, Halsey Minor,Stewart Henderson,Mark Iscaro and Igor Sill of Geneva Venture Partners.